The 100 percent electric Nissan LEAF has taken to the roads of Europe for an all-electric Grand Tour, travelling across Europe’s most breath-taking rural and coastal driving routes. The epic journey saw the Nissan LEAF take on six of the most beautiful drives in Italy, Spain, Germany, Norway, Scotland and France; including Italy’s iconic Mount Etna and historic cities, such as Granada, Spain, and Marseille, France. The new LEAF 30 kWh journeyed over 650 km on an adventure to visit Europe’s most spectacular destinations, showcasing its low running costs of just €3 per 100 km. Across Europe, 54 percent of drivers would prefer to travel by car rather than by any other form of transport, but with many concerned about the cost of fuel, Nissan has proven itself to be the ultimate travel companion. With the LEAF’s 30 kWh battery now offering 250 km in driving range and as many as 2,800 quick chargers installed across Europe, driving a zero-emission car is more practical and enjoyable than ever before, giving EV drivers total peace of mind to enjoy longer cross country drives. Gareth Dunsmore, Director of Electric Vehicles at Nissan Europe, said: “The Nissan LEAF is much more than just a city car and is an ideal zero-emission solution. With five seats and 370 litres standard luggage capacity, the Nissan LEAF 30 kWh is perfect for those long family getaways this summer. 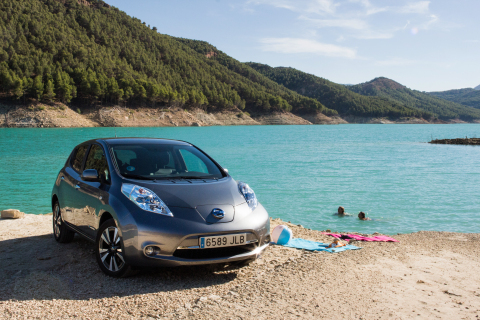 LEAF’s low running costs and quiet drivetrain make family holidays cheaper and more peaceful than ever before. Nissan pioneered the EV movement with the introduction of the world’s first mass-market EV, the Nissan LEAF, in 2010. Since then it has gone on to sell over 228,000 LEAFs globally, with more than 59,000 of these gracing the roads of Europe, making it the world’s best ever selling electric vehicle.